H. S. Jennings began his career, after graduating from high school in his home town of Tonica, Illinois, as a teacher in typical one-room country schools. His interests were at first mainly in the humanities, and these interests prevailed even after a year (1889) as Assistant Professor of Botany and Horticulture in the Texas Agricultural and Mechanical college, a position to which he was called by a former teacher. Not until he came under Reighard's influence at Michigan during his undergraduate years (1890-93) did he finally decide upon a career in Biology. While at Michigan, he became familiar with the two groups of organisms used in nearly all of his subsequent work, the Protozoa and Rotifera, on which he made surveys for the U. S. eish commission^ Biological Survey of the Great Lakes. After a year of graduate work at the university of michigan; he continued under mark at harvard university (A.M., 1895; Ph.D., 1896). His thesis on the development of a rotifer won the Walker Prize of the Boston Society of Natural History. Although this work was descriptive, he acquired under the influence of Davenport an enthusiasm for experimental methods, which were Just then beginning to spread among biologists. This new interest was fostered by Harvard^ award to him of the parker travelling fellowship which he used for a year of study and research in Jena and Naples. During that year, he studied the responses of Paramecium to stimuli, the beginning of a program that was finally summarized in his famous book of 1906 on ^The Behavior of Lower Organisms." During the same year (1897), Jennings gave much thought and study to the fundamental problems of biology, the fruits of this reflection serving, according to his own account, as a basis for his study, thinking and research during the remainder of his life. Returning to America, he rapidly rose to eminence. After two years in temporary posts, he went to michigan (Instructor, 1899-1901; Assistant Professor, 1901-03) where he continued his study of behavior, directed the Survey of the Great Lakes, and was coauthor with reighard of the well-known "Anatomy of the Cat." When the first edition of "American Men of Science^ appeared, he was among the starred Zoologists. In 1903 he went to the university or pennsylvania and three years later brooks brought him to johns hopkins. He succeeded brooks in 1910 as henry walters professor or zoology and Director of the Zoological Laboratory, a position he held with distinction until his retirement in 1938. He then migrated to Los Angeles as Visiting Professor and Research Associate at the university or california where he remained until his death. During the decade in which jennings was pursuing his classic study of protozoan behavior, mendel^s laws were rediscovered and he was quick to perceive the unique advantages the Protozoa possessed for genetic investigations: they multiplied rapidly, could be handled in large numbers, and combined the features of vegetative and sexual reproduction. Seizing his opportunity, he began the study of the genetics of Protozoa to which nearly all of his experimental work during the remaining 40 years of his life was to be devoted. In a series of fundamental, exhaustive, pioneer papers on Paramecium, published between 1908 and 1913, he laid broad and deep foundations for all subsequent genetic work on Protozoa. First of all, he showed that heredity and its problems are essentially the same in microorganisms, even during purely asexual reproduction, as in higher organisms. Second, he formulated the Pure Line Theory for vegetative reproduction shortly after johannsen^s comparable theory for sexual reproduction. Third, he analyzed the phenomenon of assortative mating and pointed out its role in the isolation of races. Fourth, he demonstrated the principle of biparental inheritance at conjugation. Finally, he proved that conjugation, like fertilization in higher organisms, results in new combinations of hereditary traits; but his results forced him to warn that "Mendelian recombination might not be the whole of the matter." This period of his career closed in 1916 with his paper on selection in Difflugia, a rhizopod with marked shell characters admirably suited for selection studies. This paper dealt with the rare exceptions to the Pure Line Theory which he believed to be the building blocks of evolution. He claimed, in fact, to have seen evolution in progress. The work of this period was summarized and brought in relation to other work in his book ^Life and Death, Heredity and Evolution in Unicellular Organisms^ (1920) and in his monograph "Genetics of the Protozoa" published in Bibliographia Genetica (1929). After 1916, he published only a few experimental papers until, in 1938 at the age of 69, with retirement and full time for research just ahead, he returned again to the attack, full of energy and enthusiasm. He singled out Paramecizim bursaria and pursued investigations on it until shortly before his death. His work on P. bursaria appeared in nine papers between 1938 and 1945. They dealt partly with the genetics of mating types and partly with senescence. The chief results were the unravelling of the complex breeding structure of the species, the accumulation of extensive data on the inheritance of the mating types, and the role of fertilization in the life cycle. His last paper concluded with the statement that rejuvenescence due to the union of two nuclei is one "of the ultimate brute facts of biology." Jennings was so struck by the continued production of hereditarily diverse clones at conjugation, even after many successive inbreedings, that he undertook to examine the matter mathematically. As a result, general formulae for the results of diverse systems of mating were published in a series of papers between 1912 and 1917; these were one of the main seeds from which the whole field of mathematical genetics developed. He then directed his mathematical and logical powers to a study of the current theories of crossing over, interference and the linear arrangement of the genes. In 1917, he disposed of the variable force theory of crossing over; in 1923, he presented a detailed critical analysis of the Drosophila data and showed that the linear theory with crossing over and interference completely explained the data in a way that no alternative theory could hope to rival. In like manner, he manifested in a long series of publications an appreciation of the significance of various aspects of the rapidly accumulating work in genetics. He dealt with selection and mutation, multiple factors and multiple alleles, the demise of the unit factor and representative particle interpretation of Mendelism, the inheritance of acquired characters, the interaction of genes and environment in the determination of the phenotype, and the limitations of evolution by loss. 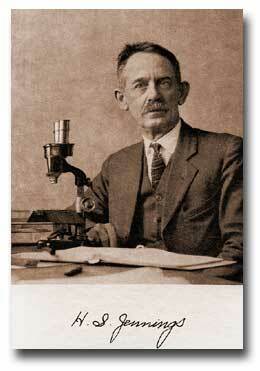 These views he summarized in 1935 in his book "Genetics^ along with a masterly treatment of the whole field. Most of his views were or came to be generally accepted, except, perhaps, his view that the known types of mutations could not be the basis of evolution. This view was developed fully in his book "Genetic Variation in Relation to Evolution" (1935). Jennings was recognized by geneticists as one of their ablest leaders. He was the first chairman of the Joint Genetics Section of the American Society of Zoologists and the Botanical Society of America, which after ten years developed into the Genetics Society of America; and he was a member of the original editorial board of GENETICS. Jennings was also outstandingly successful in interpreting the significance of modern genetics and allied fields to the general biologist and the general public. He accomplished this by a long series of articles in non-technical magazines and by his popular little book "Prometheus, or Biology and the Advancement of Man" (1925); but his chief contribution of this sort was his very influential larger book "The Biological Basis of Human Nature" (1930). This book has at the center of interest problems of human personality and society, but is based solidly on an introductory exposition of the status of genetics and experimental embryology. The facts of these fields are then applied to problems of eugenics, marriage, race mixture and the role of the environment. In an outstanding chapter, he exposes 14 common biological fallacies with important bearings on human affairs; but perhaps the most remarkable chapter in the book is the one on "biology and selves" which presents his personal philosophical evaluation of the bearing of genetics on the problem of the ego. Probably no book by a geneticist has been so widely quoted by American workers in the fields of education, sociology, anthropology, and psychology. In spite of inevitable misquotation and misinterpretation, it has exercised a distinctly salutary effect on those fields and is to a large extent responsible for whatever they have assimilated in this country from modern genetics. The high esteem with which JENNINGS was widely regarded was based not only on his pioneer investigations, his masterly grasp of biology and his gift for sound popular exposition, but also on personal qualities that shone through his writings. His neat balance between respect for evidence and interest in its significance permitted him to follow with boldness and impersonal objectivity wherever the evidence led. He did not hesitate, therefore, to oppose with equal force both LOEB'S mechanistic interpretation of behavior and DRIESCH'S vit^listic interpretation of development. No matter bow strongly he had expressed himself, however, he was always ready to examine new evidence and alter his views when the data called for it After many years of vigorous opposition to CALKINS; views on the life cycle and rejuvenescence in Paramecium, he devotfed seven years near the end of his life to direct study of the matter and completely reversed his earlier views. Moreover, he was meticulously careful to distinguish between opinion and legitimate conclusions from evidence. Tn "The Universe and Life^ he set forth in this way his views on many matters outside the realm of scientific demonstration. He brought the same fairness and objectivity into his social contacts, giving opinions when asked, but expecting each individual to form his own judgments. He was brilliant, but without a trace of egotism; ordinarily gentle, but firm on matters of principle; purposeful, but enjoying to the full the varied experiences of life; serious, but preserving always a keen and lively sense of humor. Those who were privileged to know him recognized in him the qualities of a great scientist and a great man. Commentary in The Journal of Heredity 77:481-482. 1986. I appreciate the opportunity to present an opposing opinion to that expressed by A. C. Faberge in his review of Daniel Kevles book, In the Name of Eugenics and the Uses of Human Heredity (Journal of Heredity 77:287-288. 1986). Ones responses to this book, and the story it tells, are conditioned by several factors that need to be discussed. One of the somewhat hidden issues is a kind of territorial conflict; the history of science belongs on whose turf? that of the historian or that of the disciplined scientist? I recently proposed a symposium on the history of genetics, whose participants would include historians and sociologists. The proposal met stout opposition from geneticists, and one of the counter-proposals was that we can have some of the older geneticists speak; they were there, and can tell us what happened. The objection to the symposium was in part an objection to outsiders, who dont really understand genetics invading a disciplinary territory. Most of the history of biology that has been read by biologists has been written by biologists. Ernst Mayr, though a marvelous manufacturer of myths, is assumed to be a qualified historian because his biological credentials are thought tobe impeccable. Kevles (and presumably any mere historian) is charged by Faberge with not understanding .what he writes about, regardless of how much he may have studied the relevant documents. Historians of science are, necessarily, especially sensitive to this criticism, and some go to extraordinary lengths to become proficient in a broad range of the relevant subject matters; they often develop a much greater general understanding of the scientific issues than did, or do, participants in some narrow stream. Perhaps equally importantly they have escaped to some extent the acculturation of the discipline and its imbedded myths. In my first attempt at an historical account, I included a passing reference to an opinion of Darwins that I had learned long ago. An historian friend gently disabused me of an egregious error. But a biological reviewer of the manuscript called upon me to reinstate the opinion which he also had received as revealed truth. Not long ago I received a letter from a young historian in which he expressed concern over the turf issue. He had come to some substantive judgments about a disputed scientific issue, but wondered about the consequences of expressing a conclusion regarding something that was clearly over, but just over, the edge of the science/history interphase. Although I encouraged him, I was aware that I was tempting him into the lions den. Should biologists resent the intrusion of humanists and social scientists who express an interest in our doings? Or should we cooperate with and encourage them in their undertakings? My personal answer is clear. I have stumbled over far too many myths in my scientific training to feel confident of the historicity of the official interpretations. I doubt that biologists are much more guilty than anyone else of constructing history to make ourselves look good, but I doubt that we are any less guilty either. Of course the participants have important testimony to give; but we should never have the last word. At some point an outsider is required who has some personal distance from the subject at issue. Certainly historians and sociologists also have vested interests, which may be even more blinding than those of the scientists, but their interests are to some degree tangential to ours and somewhat distant from the conflicts and the personalities under study. They provide an essential corrective to our errors. Faberges review is more complicated than a simple territorial defense, however; it also reflects the disciplinary anxiety about whether real geneticists should own, or own up to, that turf at all. The problem is not only that Kevles is writing about a subject in which he is improperly qualified, but that he is telling a story that many geneticists consider well-forgotten. The story is in fact not so much forgotten as repressed. Despite the shocking events that Kevles recounts, this is not a story I was ever exposed to in my genetics training, formally or informally, and it is now news to a whole generation of geneticists, obviously unwelcome news to many. To understand the official genetics attitude toward the eugenics movement, we have to take into account the transmitted myths concerning our intellectual history, and the ways in which they differ from the interpretations of careful historical analysis. Geneticists have come a long way in our struggle for legitimacy and authority since the turn of the century (see Sapp, Hist. Biol. 16, 311, 1986), and we have gradually eased away from our involvement with social issues, toward identification as elite specialists in high-tech industrial and medical biochemistry. Geneticists are now likely to ask whether the eugenics business was really part of our history, though no one else is very happy to claim it either. Geneticists disengagement is illustrated by the neglect or superficial treatment of deep and divisive issues such as I.Q. in all our mainline genetic texts (see Diane Pauls Commentary in Quart. Rev. Biol. 60, 317, 1985). Our retreat from these issues also appeared to me to underlie the reluctance, mentioned earlier, of two of our societies to sponsor a symposium on the history of science/society interactions during the last hundred years. was surprised to learn in Kevles book that Herbert Spencer Jenningsmy scientific grandfather, through T. M. Sonnebornwas the chief American spokesman against the eugenic excesses of the 1920s. I thought I knew Jennings career reasonably wellthrough reading his scientific papers, from hearing personal reminiscences, and from studying the biographical memoir that Sonneborn prepared, and over which he had labored for nearly three decades before he turned it loose. Some of Jennings social activities, as well as some of Dr. Davenports, were mentionedbut no hint was given of Jennings science/society efforts. This was a scientific biography, and reference to such matters was presumably considered inappropriate. I dont like to spoil a story by telling too much in a review, but the story that Kevles tells is one I believe all geneticists need to know. I am aware that many busy professionals read a lot more book reviews than books. They need something besides the reviewers judgments on the book, because they are, unfortunately, reading reviews as substitutes for reading books. Because I doubt that one can grasp the eugenics story by reading Faberges review, I am prompted to spell out a few details, even if they fail to bring the readers to the full richly documented account. Mendelism arrived in Britain with the advocacy of William Bateson, who assaulted the entrenched Galtonian genetic establishment. The Mendelian approach contrasted with the Galtonian in several important respects, and the accommodation (as part of The Modern Synthesis) required several decades to become firm. Galton began his genetic studies preoccupied with human diversityperhaps because of shocks sustained during his African travels, perhaps simply as a concerned member of the landed gentry on the back side of the Industrial Revolution. In any case he was a determined genetic determinist, and began the Eugenics Movement, in hopes of fending off the evils of unrestricted reproduction of inferior classes and peoples. America had no genetics established at the turn of the century, and eagerly imported both Mendelism and Galtonism, assuming perhaps that the British disputes reflected conflicts of institutions and personalities, as much as conceptual difficulties. Institutional genetics developed rapidly, gaining public support from agricultural applications such as the hybrid corn programfor which it honestly had little responsibilityand medical implications, perhaps including the human blood group studies that facilitated blood transfusions in World War I. The new science of genetics, however, also encountered a society looking forward eagerly to a new century of science and technology, enthralled with the possibilities of steam engines and gasoline engines, airplanes, electric lights and telephones. It was an immature and uneasy society, with a wide range of economic well-being; a rising middle class was threatened by the continuing influx of immigrants; a newly wealthy industrial class, enriched by the exploitation of natural resources and industrial opportunities, was anxious to protect its interests and extend its values, fearful of the libertarian lack of restraint in the behavior of a populace still revelling in the freedom of the frontier or the heady atmosphere of Ellis Island. The soil was fertile for the apparent scientific support of a deep-seated folk belief in genetic determination of human quality and human behavior. The scraps of the Mendelians in Britain had equipped disciplinary geneticists with remarkable explanatory power. The genotype/pheno-type distinction separated genetic transmission from genetic expression, and excused geneticists from dealing with the intractible problems of embryology and physiology. The discovery and naming of pleiotropy and polygeny, of pen-etrance and expressivity, along with impressive terms like heterozygosity and multiple allelo-morphs, enabled an enterprising geneticist to discover modified Mendelian patterns for pauperism, sexual misbehavior, mental deficiency, and just about any socially disturbing human characteristic. The intellectual shabbiness of the whole structure was not apparent until the German Nazis enacted their versions of the eugenic laws in the early 1930s. The founding of the Genetics Society of America in 1933, and the development of textbooks exhibiting, and a powerful tradition endorsing, social disengagement, allowed disciplinary distance to be gained from the excesses of the American Genetic Association, that had become too involved in the eugenics movement for comfort. The AGA retreated into its original concernswhen it was called the American Breeders Associationand kept a low profile until, half a century later, few geneticists in either organization know why we have two American genetics societies. I don’t believe anyone has much cause for pride in this story, but I see some cause for concern when part of our history is denied or covered up. Genetic hubris was not totally expunged in 1933. It is not my intention to defend Kevles’ book in detail. All the story has not yet been told, and much remains to be understood concerning the ways of science in society. Some of Faberge’s criticisms of detail may be well taken. But Fa-berge’s apparent intentto deflect potential readersis wrong in my opinion. Kevles’ book is a good book, by an industrious and well-qualified historian, who tells a story we should not ignore.